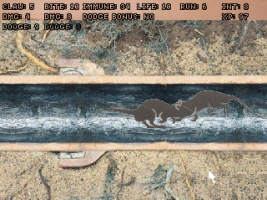 You play as a sewer rat who, one day, detects a delicious smell coming from a plate of food accidentally left out overnight on a restaurant counter somewhere far above his sewer-pipe lair. YOU MUST DEVOUR IT!!! Along the way you will encounter enemies to fight, poisonous bait, a powerful final boss enemy and, hopefully, some moments to make your skin crawl. Save up your XP and return to your lair to buy upgrades to your stats and skills and maybe eventually you will defeat the final boss enemy and get to the exquisite prize! Very difficult! I'd like to see the GUI tidied up, make the stats easier to understand, perhaps having different colours or even symbols to represent the different stats. Tons of potential, hope to see this updated! This is a nicely made RPG, *very* tough though, play at your own risk! I like this sort of game and do like a good challenge, but I have to admit that I wished there was a slightly easier setting (or even just not have to spend XP to save the game). 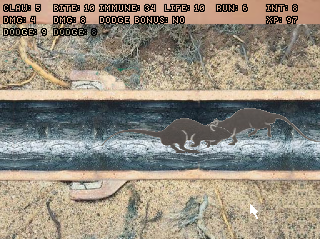 The animation of the rat running is a thing of beauty and I wonder if it was adapted from motion capture. Not sure if Mandle is planning on expanding this but there's plenty of potential there if he does.